What Day Of The Week Was January 27? 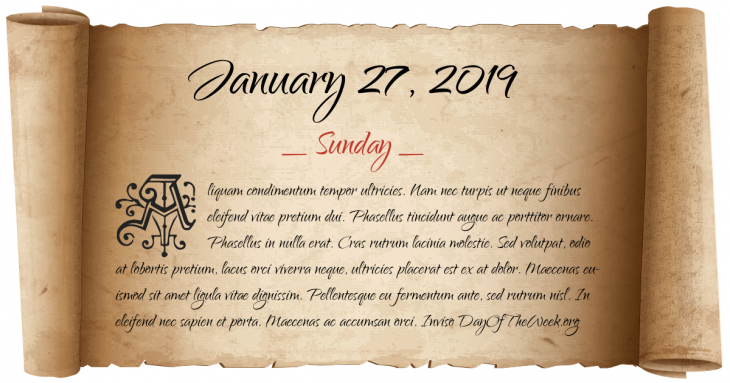 January 27, 2019 was the 27th day of the year 2019 in the Gregorian calendar. There were 338 days remaining until the end of the year. The day of the week was Sunday. The Rashidun Caliphate ends with death of Ali. World War II: The Red Army liberates the Auschwitz-Birkenau concentration camp in Poland. The United States, United Kingdom, and Soviet Union sign the Outer Space Treaty in Washington, D.C., banning deployment of nuclear weapons in space, and limiting use of the Moon and other celestial bodies to peaceful purposes. Who were born on January 27?